The most amiable of Britain’s early Hanoverian monarchs seems to have been Caroline of Ansbach (1683-1737), wife (and cousin) of George II; she was on friendly terms with Newton, Leibniz, Voltaire and Pope, and was an avid patron of the arts and supporter of Handel. 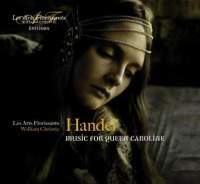 The anthem My heart is inditing was sung when she was crowned at Westminster Abbey in 1727 but William Christie ignores that and instead launches ‘Music for Queen Caroline’ with The King shall rejoice (which, of course, is all about George II). The so-called ‘Caroline’ Te Deum is the shortest and most intimately scaled of Handel’s five settings of the canticle. Performed in church services welcoming the newly arrived Hanoverian royal family to St James’s Palace in 1714, it has scant connection to Caroline (then the Princess of Wales), but you can’t keep a good nickname down. Soloists Tim Mead, Sean Clayton and Lisandro Abadie contribute to a solid alternative to The King’s Consort’s polished reading (Hyperion, 12/89), although Christie’s big coronation-size choir dwarfs music designed for the intimacy of the Chapel Royal. Queen Caroline’s funeral service at Westminster Abbey in 1737 featured the full anthem The ways of Zion do mourn. Containing a marvellous variety of affects and styles within a coherent expression of nuanced mourning, I reckon it is Handel’s greatest achievement as a composer of English church music. Christie’s liberty of adding drums rolls to the plangent string introduction is a bridge too far for my taste, but otherwise sublime slow music is sonorously satisfying and builds with emotional conviction. Gently lilting strings and the full choir’s blossoming sonorities underline the eloquence of Handel’s nostalgic memories of Caroline’s virtues in ‘When the ear heard her’. Christie’s jolting abrasiveness for ‘How are the mighty fall’n’ is a rare misstep into unpersuasive exaggeration, and the sudden retraction to inauthentic (albeit lovely) solo voices in ‘She deliver’d the poor that cried’ is an artificial contrivance that calls attention to its own unlikelihood. Christie’s handling of the archaic quick sections in ‘Their bodies are buried in peace’ is surprisingly ploddy but his judgement of the melancholic coda for strings that concludes the anthem bleakly on a bare octave (ie without harmony) is profoundly beautiful. With such a paltry discography, this performance will do nicely until the piece gets the broader recognition it deserves.